Tutorial alert! 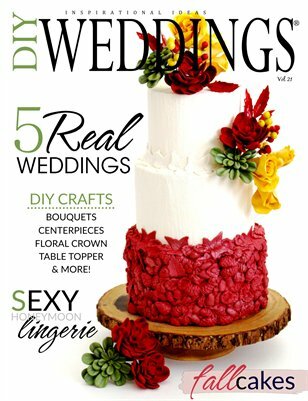 We have so many awesome craft projects in this issue from creating your own boquets, floral crown, to how to make a Downton Abbey pearl inspired tabletop. The cover is hard to miss with this gorgeous cake created by Candace Chand of Beau Petit Cupcakes. Candace kicks-off our Fall line-up of cakes from around the world. We have 5 amazing Real Weddings from talented couples who share their creative ideas from their own weddings.